We purchased 5 of these scanners for our business and can categorically state that they are fantastic little machines!! Easy to set up and user friendly. Excellent scanner that has no separate power feed making it very useable when away from home or the office. Very fast in operation too! 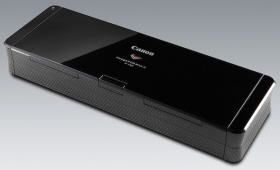 As a firm we have been using 2 Canon P 150 scanners. I personally have one on my desk. I find it very useful particularly if I get post that I want to save, or meeting minutes, these can be scanned retained on the computer file and the hard copy destroyed. Although not the fastest of machines, it's quick enough for me; small and unobtrusive on my desk, and of course portable. Happy to say that the 2 x Canon P-150 scanners are working well. We actually bought them after a trial of 2 previous scanners. Easy to use and transport in their neat carrycases. Thank you also for pointing out the pdf edit software available on the CD. With a light chassis and ultra-compact footprint, the P-150 is ideal for both the small office and home office where space is at a premium – and for mobile executives needing to scan documents while on the move. The P-150 saves users time and helps them do more: simultaneously scanning both sides of a document at up to 15ppm; and featuring a class-leading 20-sheet automatic document feeder for speedy batch scanning. And because it's so easy to transport, enterprises can give remote workers easy access to scanning when they're out of the office. This helps to speed the processing of important documents, such as purchase orders, invoices and commission claims – delivering welcome productivity benefits and cost savings. Perfect in a small office or home office environment. The P-150's tiny footprint and stylish design means it's equally at home in a SOHO environment. Our CaptureOnTouch software also makes it so simple for everyone to scan. No other scanner fits so neatly into a briefcase, or laptop bag, and USB-based power up means that users don't have to carry an AC adapter either. Simply plug the P-150 into your laptop and start scanning. Built-in CaptureOnTouch lite software also lets mobile executives scan from other people's PCs without installing an intrusive driver or new application. A Precision 600dpi sensor delivers outstanding image quality – while a rich range of image-processing features, such as Auto-colour Detection, Auto Paper Size, Deskew Detection and Text Orientation Recognition, ensures superb scan quality and efficiency. Canon's CaptureOnTouch software provides easy and effective scanning, including simple one touch operation for routine tasks, such as scan-to-email or scan-to-desktop. The P-150 interfaces with a whole range of other imaging applications, thanks to the included TWAIN and ISIS standard drivers. Canon's CaptureOnTouch software and integrated applications, such as BizCard Reader, let users scan and import business cards directly into their contacts file. PaperPort also enables better filing, management and retrieval of electronic files. With USB Power and low 5W power draw, the P-150 is an environmentally-friendly choice. It easily meets ENERGY STAR compliance for energy efficiency and requiring less energy costs less to run. A contemporary polished black-silk finish ensures that the P-150 is a great looking investment.